The AP Dropped the I-word! Huge news for immigrant rights: after decades of work and years of intense pressure from our community, including our friends at the Applied Research Center and Define American, The Associated Press has finally changed its hardline stance on using the term "illegal immigrants. "1 Wow. This a major win for how our nation thinks about immigrants and our communities. Words matter. This helps lay the foundation for a more just society. But here's the thing: right now, The New York Times is still dragging its feet on adopting new guidelines.2 If we push hard now, we can get this newspaper of record to stop calling people "illegal." Tell the NYT to stop calling people "illegal"
They said we couldn't get immigrant-basher Lou Dobbs off the air, but together, we did it. They said Dreamers would never gain protected status, but together, we made it happen. They said it wasn't possible to get the AP to "drop the I-word," but today, they have. Now, we must act again. 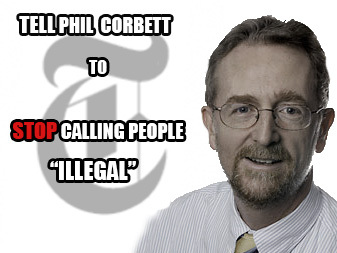 Tell the NYT to stop calling people "illegal". Let's take this victory, charge forward, and make calling people "illegal" a thing of the past. P.S. Can you donate $5 to support our work? We rely on money from people like you to see campaigns like this through. 1. "‘Illegal immigrant’ no more," Associated Press, Apr. 2, 2013. 2. "The Times, Too, Is Reconsidering the Term ‘Illegal Immigrant’," New York Times, Apr. 2, 2013.